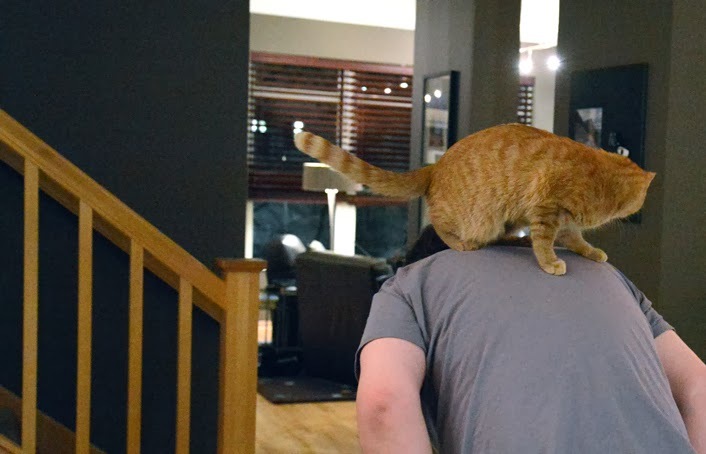 It looks to me like the cat sitter's boyfriend was giving rides to just Waffles! You can't possibly think of him as everyone, Katie! MOLMOLMOL! What I wanna know is; was Glogirly wearing her cat hat while getting a ride? Katie, Waffles is just schmoozing to get extra treats from the sitter later! Poor Katie. I hate to say it, but they do look like they are having fun. Katie, it's a boy cat thing. Raz does the same kind of thing when we have company! Not refined and stand offish like the girlcats are! Looks like it was a very fun dinner party! Our mom is being a cat sitter this week for neighbors on the first floor here. Waffles sure is sucking up to the sitter. He wants extra treats when she comes for real! Katie,it looks like a good time was had by all. Maybe you should give it a go next time? Waffles, you sure like living dangerously! We love how well socialized you are. Looks like Waffles does not believe that "curiosity killed the cat" ! Love the expression on Waffle's face! What a gorgeous shot! Don't blame you for stayin' upstairs, under the bed, one bit. Lot of cavorting goin' on downstairs, I should think. Haha! You dirty minded feline you!!! Well I hope everyone had a great dinner party! Sami would have been right there in the middle of the fun, but Sasha would be joining you UTB Katie. Looks like a fun party...you should have joined them, Katie! Aaaah, Sherpa likes to ride on people too. It must be an orange thing. Hey Katie at least you got the room to yourself and there was no paw touching. LOL. Jenna totally understands. She is a one person cat that hides out when any other human shows up. Sounds like Waffles had a lot of fun. You're really missing out, Katie. cat piggy back rides.. now that is what I call fun! I just also wanted to let you know that I am hosting a Massive Valentine's Day book giveaway featuring 21 authors! Waffles played the crowd beautifully. And Katie protected her territory under the bed. What a team! Hey Katie, if Waffles is the star, at least that means you are left alone, right? Orinch cats are the life of the party! Party on Waffles. Allie: Really. Some boycats have NO class. None at ALL. Rides to everyone?? Gasp! Even Gloman? 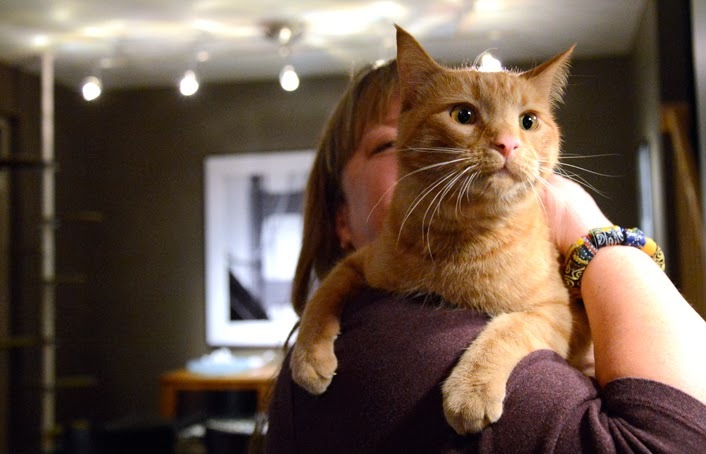 W2 looks pretty scared while the Cat Sitter is holding him. Keep a safe distance. MOL... you are too funny! Looks and sounds like Waffles had a fun time at least. Out of their hands????? How uncivilized, Katie. UTB for me. When there's too much insanity going on, under the bed is the best place to be! You should try it sometime ! !